I am very proud today! 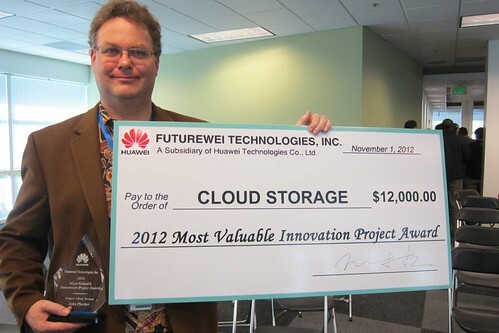 My husband John Plocher and his development team won Futurewei Technologies’ 2012 Most Valuable Innovation Project Award for their Cloud Storage project. John’s boss, Jim Hughes, is traveling in China so John (the Software Architect) made the acceptance speech at today’s big event. The team will split the award bonus.